New Construction - your opportunity to own a home designed and built by nationally renowned and multi award winning architect and builder, PHIL KEAN DESIGNS. 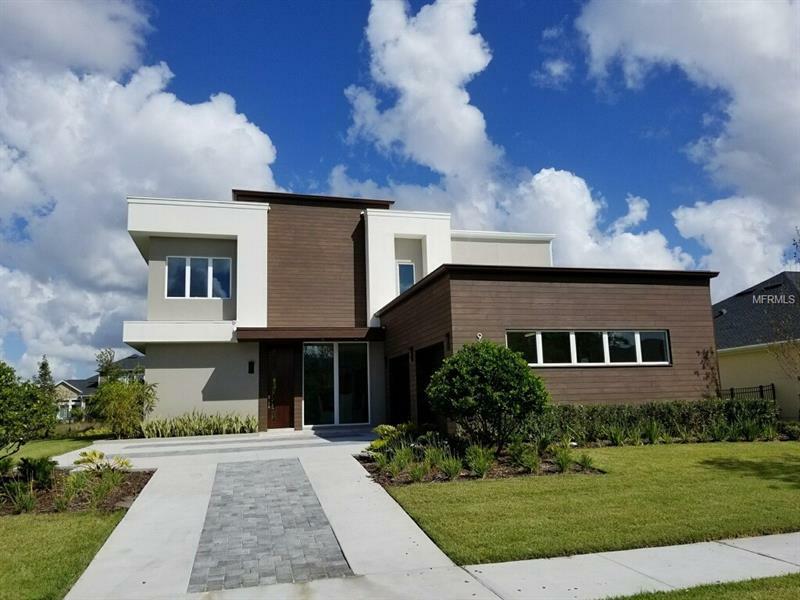 This 5 bedroom contemporary home offers many upgrades and top level finishes. Gorgeous porcelain tile and hardwood floors, custom high gloss, soft close cabinetry, floating walls and ceilings with LED backlighting, high-end Bosch appliance package including a built-in coffee/espresso machine, designer light fixtures, a floating staircase with stair tread lighting and much more. The open floor plan allows for easy living and great for entertaining. A wall of glass sliding doors gives access to the covered lanai with porcelain tile floors and the large back yard - perfect for your own pool. The private master suite offers two, large walk-in closets with custom closet systems and a spacious spa-like bath. A large bonus room on the second floor has gorgeous views of the lake. Laureate Park is one of the fastest growing communities in Central Florida, and has so much to offer - a beautiful, resort style community pool, a fitness center, a community garden, grade A public schools, playgrounds and easy access to brand new restaurants, shopping and more! Close to Orlando International Airport, USTA, beautiful golf courses and Medical City. One year Builderâs Warranty included.